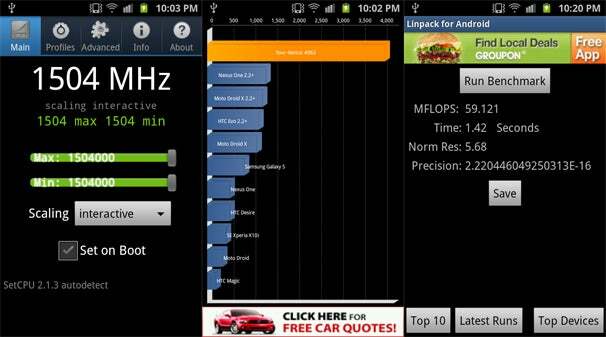 The Samsung Galaxy S II is pretty hot stuff on its own, being a 1.2 GHz Android power house in a 0.3 inch thick package, but what if you want to overclock it? Well now you can! Thanks to a rooting kernel by coolbho3000 at the XDA Developers Forum, the GSII’s processor can be bumped up to a next-generation 1.5 GHz. To get started, you’ll need USB drivers for a Windows system--sorry, Mac and Linux bots--and the latest version of odin3 to unbrand the phone. After that you’ll reboot using the using the adb reboot download, flash the kernel, root with SuperOneClick, fire up SetCPU, and let the 1.5 GHz PWNage commence. The figures that coolbho3000 pulls from the Quadrant benchmark, shows that the overclocked GSII kicks all of its predecessors in the jaw. The power is awesome according to the video of the GSII’s breakneck performance in Linpack and its 50-60 fps performance in Quadrant. Lets just hope that liquid frame rate can pull through when we want to watch some streaming movie rentals off YouTube.